This quote was written on the side of an inner-city building when we visited Edinburgh again in 2010 and I imagine that Edinburgh is one of the places many people would have on their bucket list. I’m not entirely sure that I feel completely at home there…it is beautiful, or perhaps imposing, but the greyness of the buildings is always something of a shock coming from a sunny country full of blue skies. 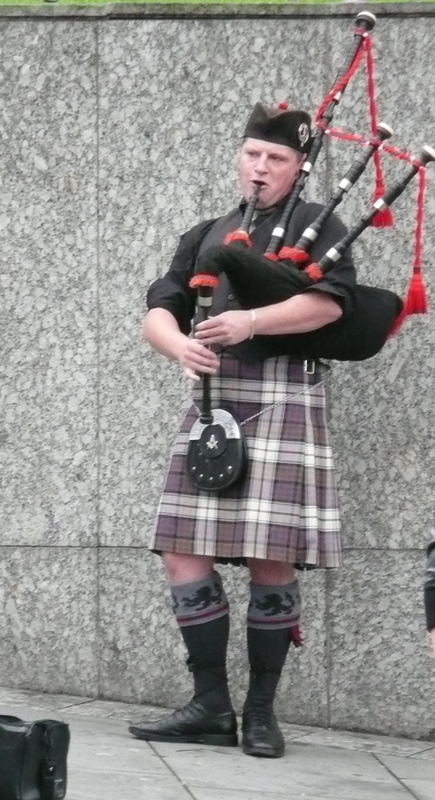 Still I love walking on the streets and hearing the skirl of the pipes, even if it is rather touristy. 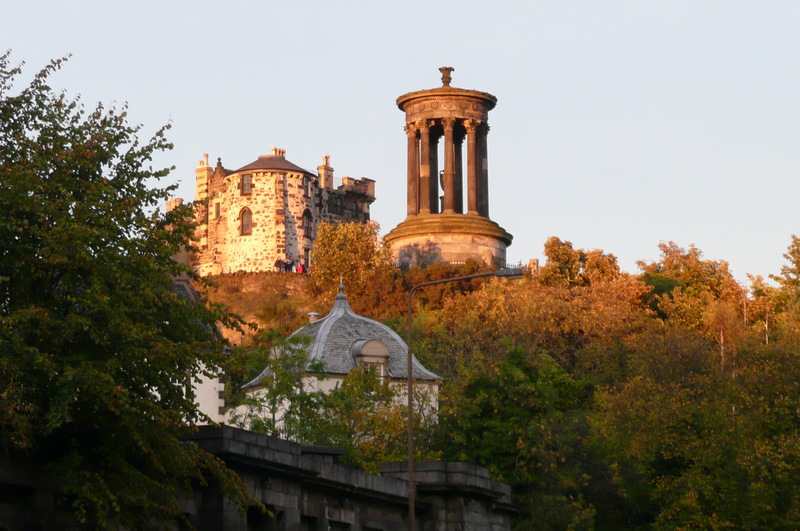 I’d be more than happy to have the opportunity to live in Edinburgh for a while….imagine being able to sit in the archives as often as you like, or to see those days where the skies are a beautiful blue! Despite having visited a few times over 40 years, I’ve rarely played the tourist. My time has invariably been occupied in the various family-history-related repositories. Thanks to the wonderful online access provided by ScotlandsPeople (SP), my most recent visit “freed” me a little to have a look around. I think I should have shares in SP as it’s by far cheaper to obtain digital copies of original records so that a real visit can be so much richer (hmm perhaps richer is not what I mean!). On my last visit I spent happy hours in West Register House (now closed) where the staff were wonderfully helpful and I could trawl kirk session records to my heart’s content…I’m looking forward to them becoming available online. 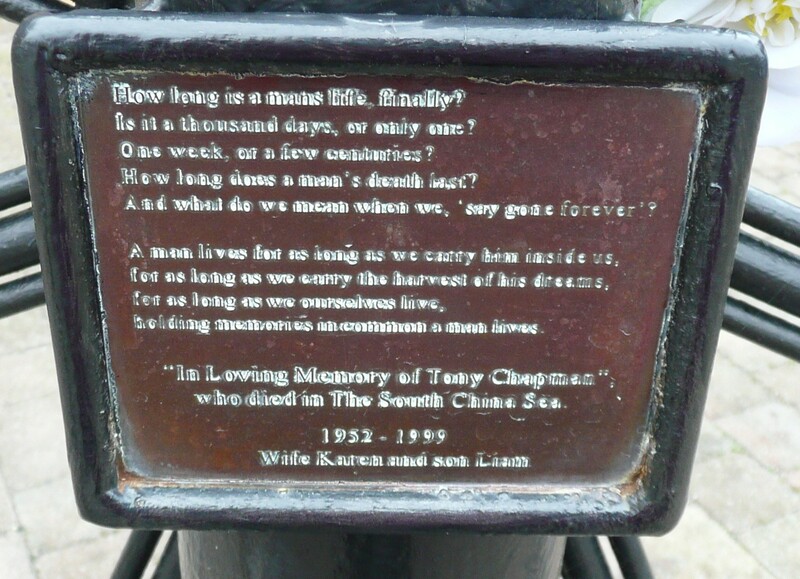 I loved the words on this memorial to a recent mariner who lost his life at sea. 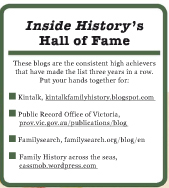 The words are the essence of what we aim for as family historians. Click on the photo to read the words. Apart from the joys of archives, I have another reason for visiting Edinburgh. My ancestor, Stephen Gillespie Melvin, and his ancestors before him, lived in Leith which is Edinburgh’s port. Once, not all that long ago, it was a bit rough, ready and run-down but these days gentrification has come calling. There are expensive apartments being built near the Water of Leith, two Michelin-starred restaurants, and historical monuments including one honouring Australia’s, and Leith’s, Governor John Hunter. What remains constant in my visits are the grey skies. Only once or twice have I seen glimpses of blue skies, even though there’s evidence on the internet that such days exist…I’m sure they can’t all be photo-shopped. I love having a link to this earthy port with its tough maritime industry to which my family contributed for a very long time. Many of my ancestral family members are buried in the South Leith churchyard but of course, not being wealthy, I’ve found no gravestones. How coincidental that having just logged into my family history program, I’ve discovered today is the 158th anniversary of the birthday of my Leith-born ancestor, Stephen Gillespie Melvin. Work as if you live in the early days of a better nation. This was one of those rare sunny days between the grey so we went to the Botanic Gardens instead of Leith …what was I thinking to not put family history first! 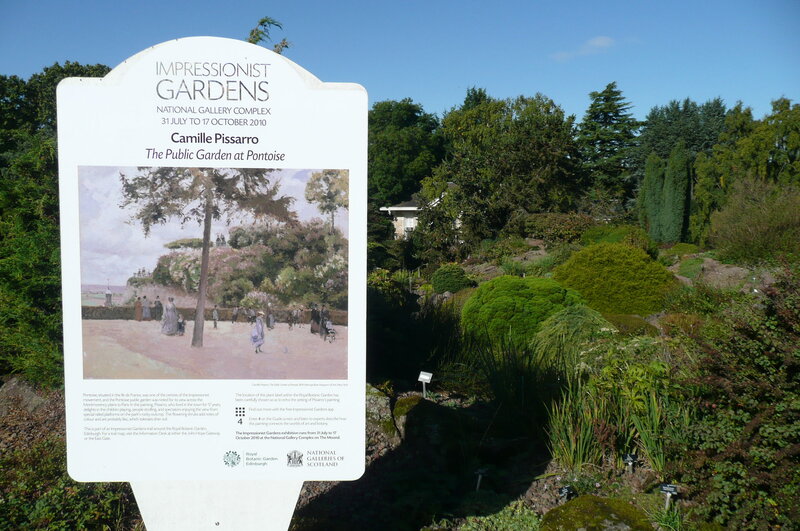 One of the luxuries of our last visit was visiting the Impressionist Gardensexhibition which was wonderful. The Botanic Gardens had a related theme with certain areas of the Gardens highlighting aspects of some of the paintings. We really loved it and had a great time wandering for hours. Actually this was a beautiful “blue sky” day so perhaps we should have prioritised Leith instead of just having fun.One evening we took a trek to the outskirts of Edinburgh to hear a great traditional band, Fiddlers Bid, from the Shetlands. The music was fantastic, but some of the commentary was lost to us in the broad accents. We also wandered around the old town looking for where another ancestor had lived and saw this sign. I’m not entirely sure I understand what it truly means, but I know I really like it…Alastair Grey himself does have an explanation of it here. Will Scotland vote for Independence I wonder? My husband is a die-hard rugby union fan, as am I, and we love to watch Scotland play if for no other reason than to listen to Flower of Scotland and belt it out in our lounge room. Sadly the playing infrequently lives up to the music. I had a Scottish rugby union jersey for the 2003 World Cup which I wore in Ireland…I kept wondering why people were looking at me strangely. Mind you, I can get behind Ireland’s Call with a similar level of enthusiasm. Ennis has no direct links to my Irish ancestry but oral history suggests that at least my 2xgreat aunt was familiar with Ennis, but whether before or after her sisters’ departure for Australia is unknown. Broadford, their home town, was on the Bianconi route between Limerick and Ennis so perhaps they were able to travel to Ennis for the markets or similar. For me, Ennis is the home of the Clare County Library and the adjacent Clare Local Studies Centre. 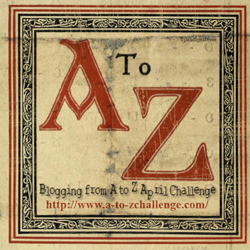 I’ve sung their praises so often in my blog so there’s little need to repeat myself and yet I can’t resist. What a great job these people do, and how wonderfully innovative and creative they can be because of the forward-thinking of the powers-that-be above them. Thanks to them Clare family historians are infinitely better served than those with ancestry in other Irish counties. Thank you, I love using the site and I loved visiting in person even more! It’s funny the things that stay in your mind about a place: the truck jammed under a bridge on the way into town; the welcome and helpfulness of the research staff at the Local Studies Centre; finding the death certificates for my Mary O’Brien’s parents even without known death dates; the river that runs beside the centre of town so that you can have lunch in a café and watch the swans go by; the old narrow streets with their medieval feel; the school kids hogging the footpath as they do the world over; an anniversary dinner in the Old Ground hotel; updating my suite of topographical Irish maps; ginger bath gel for the unheard-of travelling luxury of a hot bath; cash deliveries to the banks complete with machine-gun-toting security guards and multiple armoured vans (this chicken colonial chose to duck into the Vodaphone shop…I’m sure there was something I needed…or not). I’d love to show you some of my own photos of Ennis, but for the life of me I can’t find them, so have a look at what they have to say at the official website. I think the next time I visit I might take this rather intriguing walking tour…we think Mr Cassmob’s Clune ancestors may have come from Ennis, perhaps we’ll learn more. 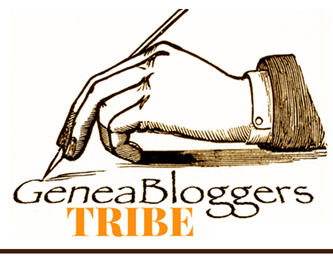 Amy Coffin of the We Tree blog, in conjunction with Geneabloggers, has a new series of weekly blogging prompts for 2012 and the theme is 52 Weeks of Abundant Genealogy. Week 10: Genealogy Roadtrips. No two genealogy road trips are the same but they’re always fun and meaningful. Describe a memorable trip in your past. Where did you go? What did you find (or not find)? Did you meet any new cousins? What did the trip mean to you and your family? 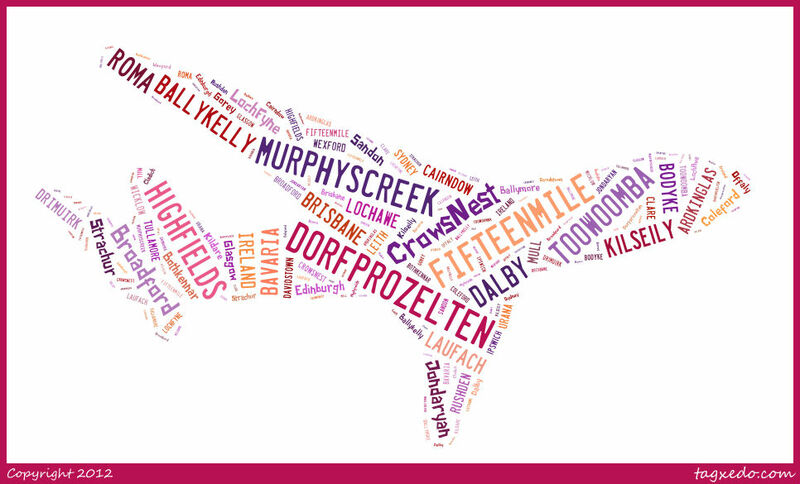 A Tagxedo word cloud of genie journeys. When I saw this topic I ran a mental scan of the genealogy trips I’ve done over the past 26 years. There have been so many that in truth I simply don’t remember each in detail –just the highlights. Many have been genealogical flight trips to places far away, either within Australia or overseas, though usually with a road trip added in. I decided on a collage of memory highlights over the decades from our genealogical journeys at home and away. The memories here focus on my Kunkel/O’Brien ancestry but I could list just as many for other ancestral families of mine, or my husband’s. 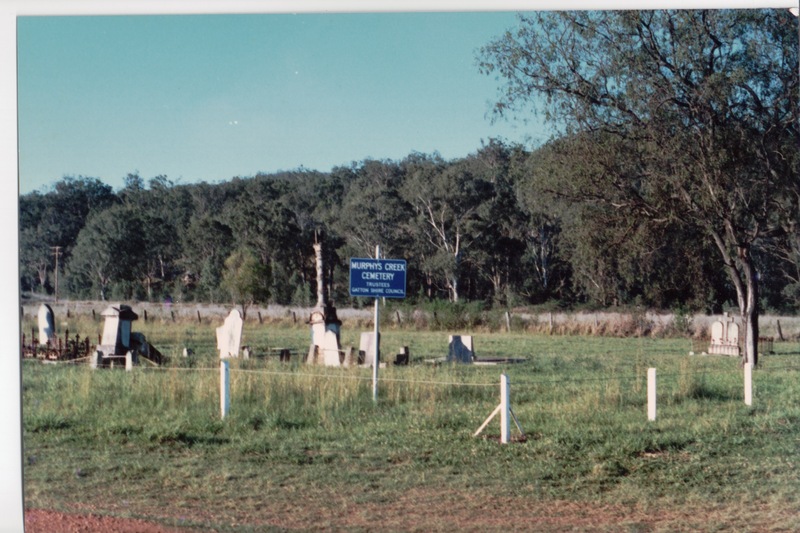 Murphys Creek cemetery circa 1987/88. The Kunkel grave is on the right nearest the trees. Driving along a gazetted roadway that felt like a private access path to other farms, so that I could see my Kunkel family farm (at a distance). Having heard that the then-resident was rather fond of his shotgun when it came to visitors I was mighty glad to have a long telephoto on my camera and wished that the cows would stop announcing my presence. 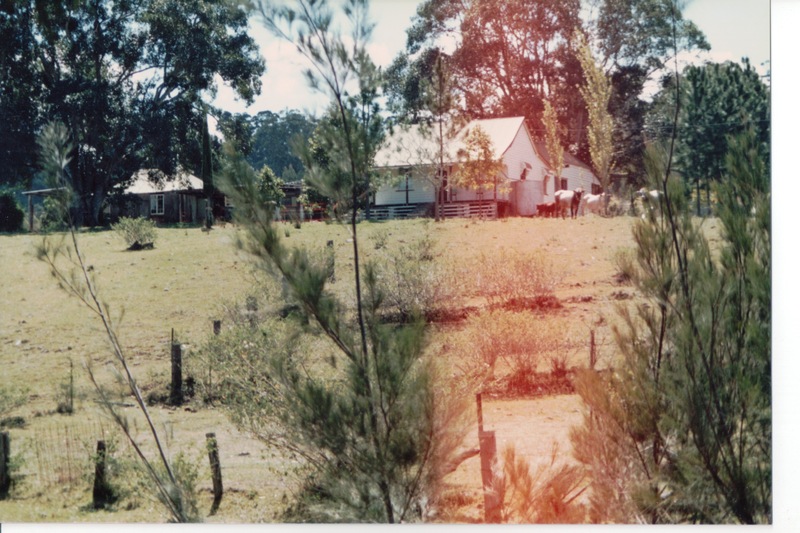 The old property circa 1988. 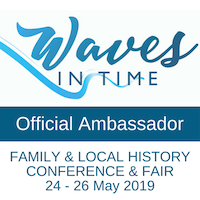 Learning about the place through genie-visits with the Kunkels’ granddaughter in Toowoomba and finding out about their life on the farm and much family history. Taking a steam train ride with a couple of my kids along the very line that my 2xgreat grandfather worked on (we all loved that trip). Many decades later, being invited to see through the old farm property and walk the land. Visiting St Mary’s Catholic Church in Ipswich to see the original registers (in those days) and finding my ancestors’ marriage entry. Being able to see the second register which had more detail and gave me the clue to George Kunkel’s place of birth. Meeting my third cousins in Sydney who shared wonderful family knowledge and photos, enabling me to link the Irish O’Briens. Visiting Drayton & Toowoomba cemetery and seeing the unmarked grave of my 2x great grandmother and her daughter, my great grandmother. Putting a marker on their grave remains one of my Bucket List items. Holding the first reunion of all the Kunkel relatives in Toowoomba –what an experience for all of us! What a noise we made with our conversations! A second reunion a few years later introduced many family members to family places they hadn’t know about before. 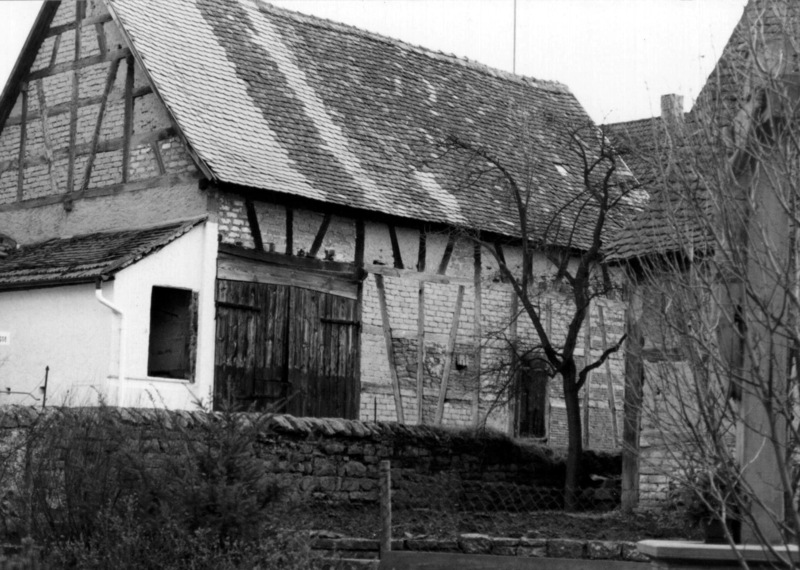 One of the old buildings in Dorfprozelten. A laborious train/walking day trip to visit the Kunkel home village of Dorfprozelten –and being told by the priest to come back another day. Protestations in German that we’d come from Australia fell on deaf ears, as had letters sent before and after the visit. Convoluted conversations in churches and cemeteries in my poor German as I tried to learn more about my family. A similar experience with a later priest who was Polish-born: a multi-lingual challenge for both of us. Some years later being shown the church registers by the then parish priest as he pulled them out of a metal compactus in the sacristy and nodded sagely at the various illegitimate births. We readily found my George Kunkel’s baptism entry. Meeting local historians in Laufach and Dorfprozelten who shared their family and local knowledge with me. The Laufach historian was something like a 5th or 6th cousin! Walking the streets of the village and getting a feel for the historical continuity of many of the buildings. A work colleague and friend had bought me these green socks to celebrate the ancestral trip to Ireland. 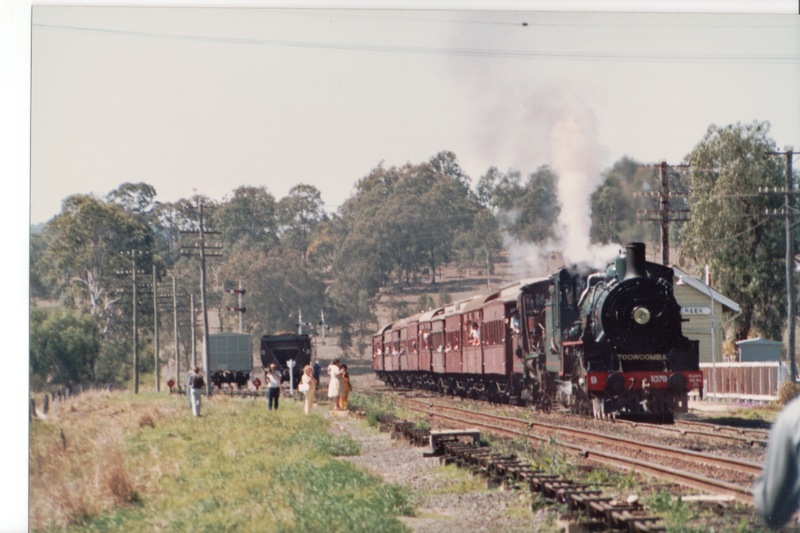 I visited Broadford first with my mother and daughter in the late 1980s. We drove in constant fog from our B&B wondering whether this was all we’d see after travelling half way round the world. A visit in the church and a prayer to my 2x great grandmother to plead our case – as we walked out the church door, the fog lifted like a blind rising. It remains one of my strangest family history experiences. My daughter celebrated her birthday that day, receiving her presents near the Broadford Catholic cemetery and then touring another one at Tuamgraney in the half dark with the owls hooting. A birthday she hasn’t forgotten! On this trip the attempt to pin down the right O’Brien family was unsuccessful. On a subsequent visit we were taken by the visiting missionary priest to meet my relatives. 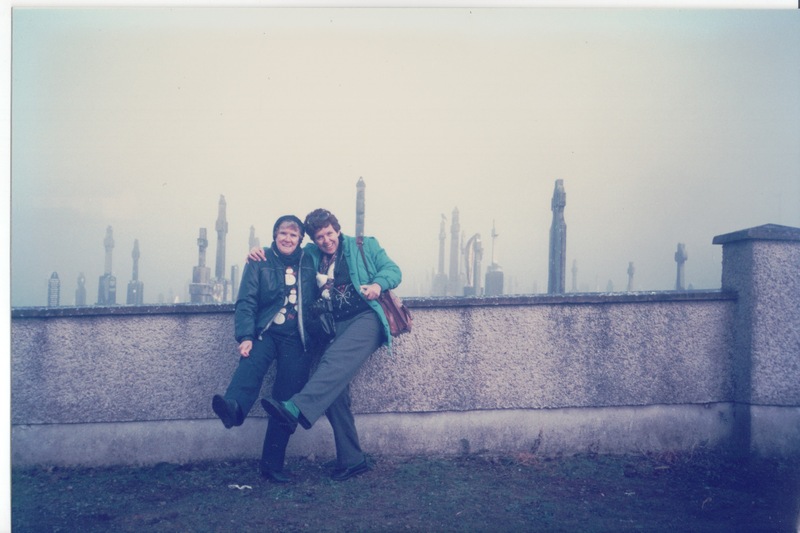 Strictly speaking they weren’t blood relations but they had inherited the various properties and were so incredibly generous and hospitable to us with Paddy taking us to see the original farm at Ballykelly. Returning all muddy and damp Nancy, his wife, helped us clean up and then fed us. The memories of this trip and subsequent meetings with them are treasured ones. Meeting third cousins in Broadford, over a pint and a whisky in the local pub. Great craic. These memories are the tip of the iceberg of our genealogical road/air trips. We’ve had such great times, seen wonderful places and met hospitable people off the beaten track. Some places immediately give a sense of homecoming, others are special but don’t tug at my heart strings. It’s been worth every dollar and every moment that we’ve spent on these adventures. I’m rearing for more adventures as time and money permit.